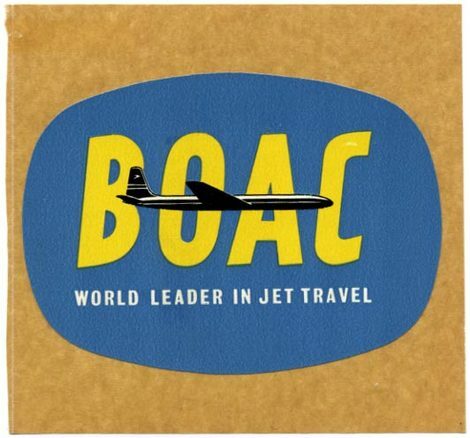 We picked up this BOAC sticker at Sunday's Ephemera Society fair (see down here), and handily we can now use it to post about a play we've just been to see. Boeing Boeing is a proper old-school farce, written by French fella Marc Camoletti back in the 60s. This latest revival is at the Comedy Theatre in London, and has an astounding cast that includes the staggeringly great Frances de la Tour (from Rising Damp, and more recently seen in The History Boys); Roger Allam* (most recently seen in The Queen); and the unfeasibly talented Mark Rylance (all round Shakespearean genius and ex-artistic director of The Globe). As if they weren't reason enough to dash out and grab a ticket before the run ends on 28 April, it's topped off with a hysterical performance from the truly wonderful Michelle Gomez (from Green Wing and Wedding Belles). * We urge you to follow this link. It's fantastic.